Does Mom or Dad like to solve puzzles or spend an hour or two everyday working on puzzles? Such activities are excellent methods for maintaining a sharp and alert mind. While many caregivers and adult children of elderly parents encourage them to engage in brain and memory enhancing skills and activities, they often forget about the benefits and pleasure to be derived from fitting puzzles. Not only is fitting puzzles together fun for most people, they keep you engaged while you're watching television, listening to the radio, or enjoying the company of friends, they also offer a variety of mental and cognitive benefits. For example, visual stimulation is a major benefit of jigsaw puzzle fitting activities. When fitting a jigsaw puzzle, the brain must constantly identify and analyze shapes of puzzle pieces. Are you looking at an outside piece or an inside piece? Do you need to find blues, reds, or other patterns on a puzzle piece? Such analysis helps the brain maintain memory, recognition, and cognitive development. In addition, fitting a jigsaw puzzle will also engage your parent's senses. Looking for a puzzle piece with the eye, reaching for it with a hand and picking it up in the fingers is a primary example of the combined stimulation and tracking provided by the brain in this sensory exercise. Initially, assessing a puzzle piece with vision and then picking it up, feeling the edges, and comparing the edges of one puzzle piece to a portion in the larger puzzle is an excellent way to encourage depth perception, shape recognition and memory. Puzzles offer a variety of designs that will interest Mom or Dad. Whether Dad selects a mountain or fishing scene, and Mom chooses a puzzle with animals, gardens or landscape scenes, there is nothing quite like the pleasure of starting with nothing and gradually creating a visually stimulating result.Depending on your parent's cognitive abilities, you can choose puzzles in a variety of sizes and shapes. For example, puzzles available with 50 to 75 pieces are large, offer relatively easy backgrounds and fun activity for short periods. Larger puzzles may range from 100 pieces to 500, 750, 1,000 or over 1,500 puzzle pieces, depending on your parent's skill level, cognitive ability, and of course, patience. If large piece puzzles are easier for Mom or Dad to see and handle, they still offer cognitive challenge and brain stimulation. For seniors who still wish to enjoy the benefits of challenging, 1,000-piece puzzles, a table magnifying glass or panel may prove beneficial, and will encourage your parent to continue with the hobbies and activities that they so enjoy. Fitting a puzzle with Mom or Dad also offers opportunities for bonding, communication, and companionship that elderly parents and adult children may not otherwise enjoy. Puzzles made available in senior community centers, assisted living facilities, nursing homes, or in your own home may encourage your parent to engage in a quiet yet extremely pleasurable activity that can be supervised or done independently. Choosing a puzzle for your elderly parent is the same as choosing a puzzle for yourself or a child. Choose puzzles that are stimulating and provide differentiations in colors and objects found within the puzzle, depending on preference and cognitive ability. 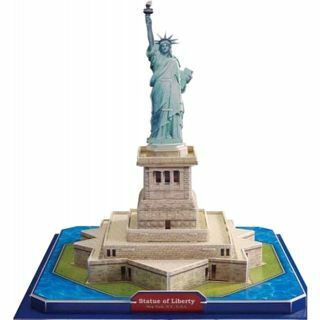 If Mom likes the outdoors, choose seascapes, mountainscapes, or choose a puzzle with houses or towns in various seasons. Mom may be a bird, dog or cat lover. Thousands of puzzles with cats, dogs and birds are available for ordering over the Internet or at your local hobby store. Choose puzzles that will bring pleasure and enjoyment to your loved one. In order for your parent to want to fit a puzzle, it should appeal to their sense of self. Choose puzzles or show them catalogs of puzzles that will cater to their likes, hobbies, and aptitude. Fitting a jigsaw puzzle not only provides hours of entertainment for an elderly loved one, but offers untold benefits in companionship, brain stimulation, and a sense of pride and accomplishment.